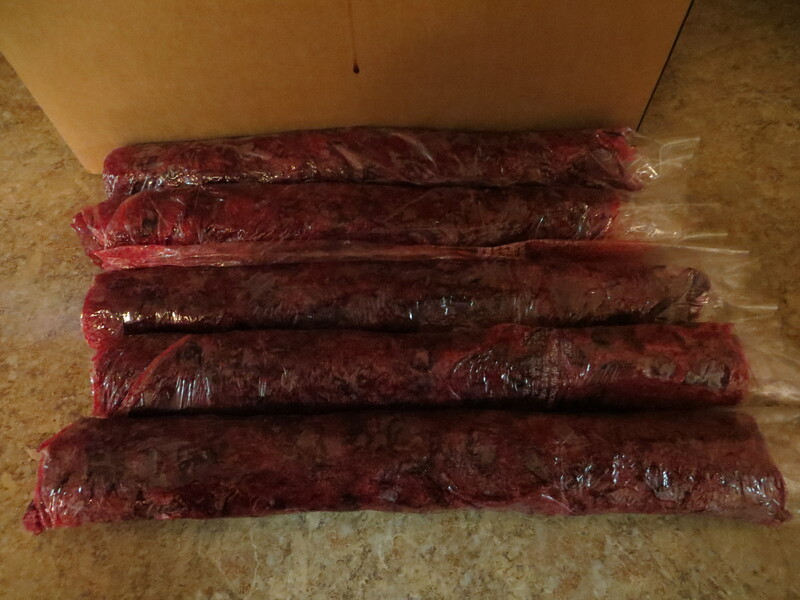 We received a box of cranberries from a hunter… and I mean A BOX. I *like* cranberries, but you’d have to eat a lot of turkey to use all those cranberries! I decided to make craisins out of most of them. 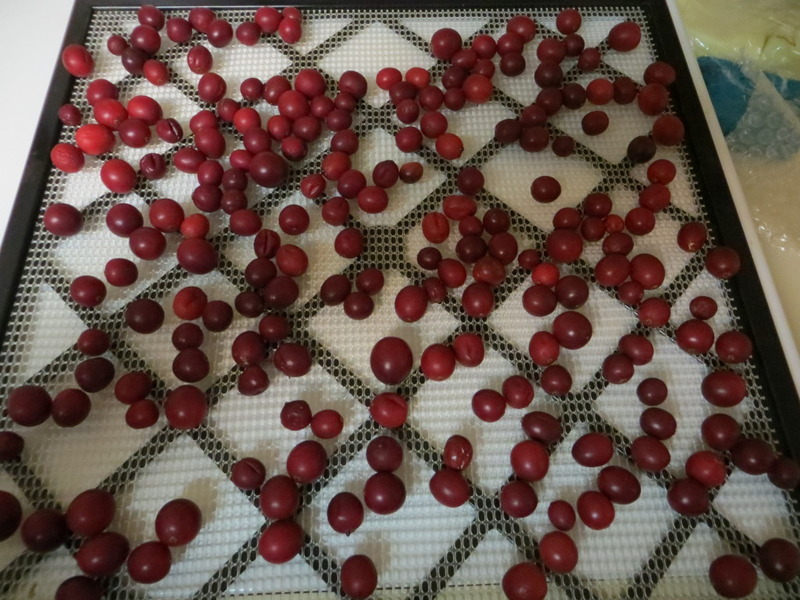 I pulled out my dehydrator and layered a bunch of cranberries on the shelves. I turned on the heat and walked away. They weren’t done in 4 hours. They weren’t done in 8. Or 24. 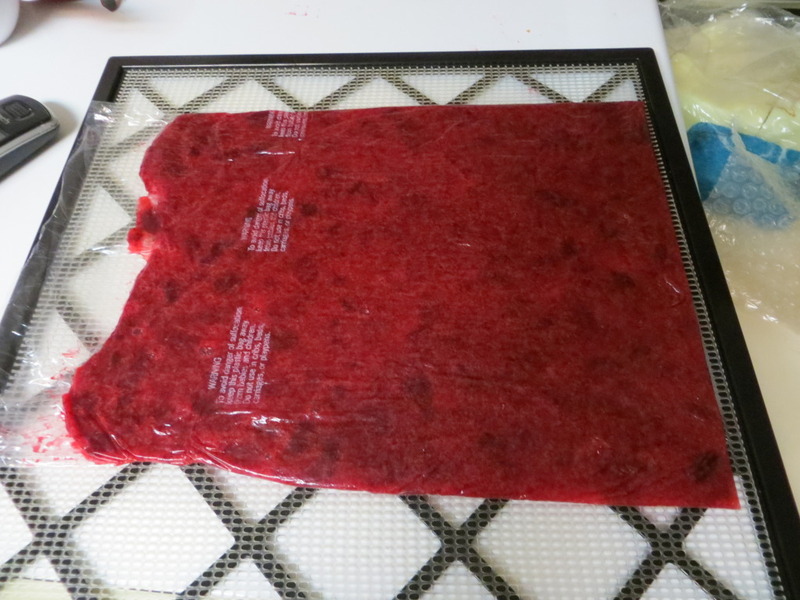 Like the intelligent person I am, I *then* went to my dehydrating book and looked up the instructions for craisins! Oh. OOOPS. Evidently, you must break the skin of the cranberries first! All I had was very puffy, very cooked cranberries. Well, I’d just put them in a plastic sack, and smush ’em to pop them and THEN make craisins. I smushed ’em alright… They were way too cooked to make craisins with now! I added sugar to the bags and made sure they were all popped. I smoothed the concoction out until it was just a thin layer in the bag. 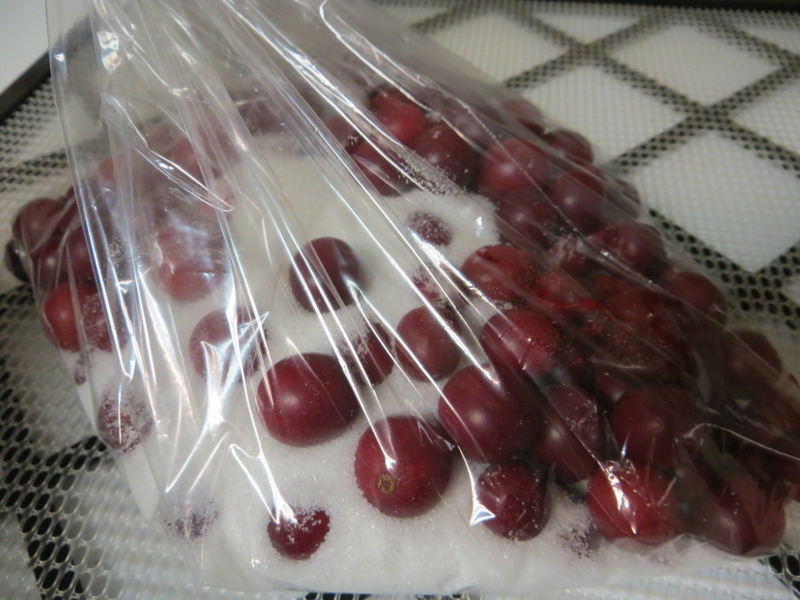 Next, I grabbed a pair of scissors and cut down the middle of the top layer of the bag… and along the bottom-ish of the bag and pulled the plastic away from the cranberries. I had now made a ”tray” of sorts to dry it on. Perfect. Today, everyone got a taste, and declared my cranberry fruit leather a success! I’ll vacuum seal it, and see how much I can feed everyone before it goes bad! 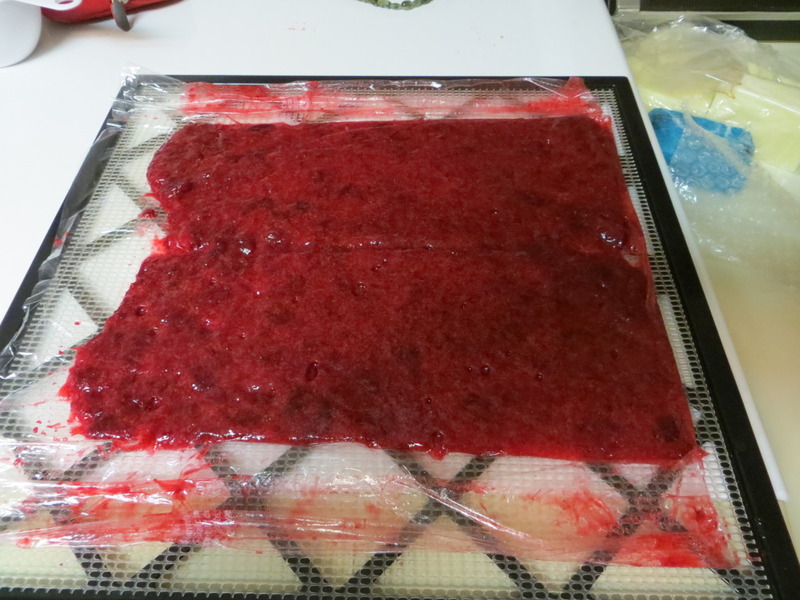 To serve, just cut a chunk off like it was a salami… the plastic will help separate it just like the storebought stuff! Unroll and enjoy! the south dakota cowgirl recently posted…And the winners are…. Ahh – red gold! They are hard to find in the stores in northern Minnesota. If we don’t go to the Cranberry Festival and pick up a bunch we end up missing out. Then it’s time to scrounge the stores and load up. I end up just putting the bags into the freezer and using throughout the winter. The leather is something I will have to try if I ever get a surplus. 🙂 Thanks for the idea. I can give you a family traditional cranberry salad recipe my mom started years ago which I’m always required to take wherever we go for Thanksgiving and Christmas dinners! All ingredients can be made the night before except the Cool Whip which then can be added before serving. Delicious! Great to read there are other ‘creative’ cooks like me. When things go wrong – as the Brits said in WWII – make do and mend. That philosophy did not help me when I made corn and something (can’t remember what) fritters to go with a bean stew. As the ‘corn’ fritters were keeping warm in the oven I noticed that the microwave was flashing. Yep, the corn was still in the microwave. I think I just served it as a side!! !